Don’t Hang Up follows two late teens hung up in the social media world. They spend their days prank-calling innocent people in some horrific, and I mean horrific, prank phone calls, which they then upload to social media to gain a cult following. We have Sam and Brady, both unlikeable characters, as they portray arrogance and ignorance to its very best. One day, after a hard few hours pranking, the boys receive their own prank phone call; a man with a very sinister and sarcastic voice calls them giving them a taste of their own medicine. At first, they take it on the chin, but things take a turn for the worst and suddenly the boys are in for a very bumpy ride with some detrimental consequences to come. The film starts like an overambitious recipe; there are a lot of different editing techniques and uses of cinematography, which is a bit overcrowded to start off with. The directors, Damian Mace and Alexis Wajsbrot, have a very impressive resume but have previously only worked in visual effects, so it is no surprise that having full creative control over a film for the first time, that they are trying as many unique techniques as possible. The film does find itself however, and the cinematography and editing becomes my favourite aspect of the film. I love the way that the camera follows the main characters about and pans and follows them in and out of every room; I feel like the camera is really on the audience’s side – it shows what the audience is thinking, which is impressive and makes the experience more immersive. I might be biased, but I love the home invasion/slasher genre and they really are my favourite type of horrors, more so because it’s things like this that can happen in the real world, as opposed to ghosts and ghouls. I really like how Don’t Hang Up incorporates social media and technology into the plot, as now more than ever, technology is such a big part of our lives. There are some parts of the film where things don’t really make any logical sense, but in some films, you’ve just got to switch that realism demanding part of your brain off and enjoy the movie. The way the film looks does make it seem better than it is; it isn’t all that original in terms of plot, but it does have a few good shocks and surprises that weren’t predictable to me (and I pride myself on guessing plot twists in films). The acting is also good; our two main actors deliver realistic performances, which carry the film right through to the end. All in all, Don’t Hang Up is actually pretty good, and I enjoyed every technical aspect of it. It’s so refreshing to see a low budget horror have so much emphasis on how it looks, because for me, if a horror doesn’t look realistic then it does take away the main aim of the genre – to scare! The film had me tensing up on my chair throughout, and I really do think it is worth your time. 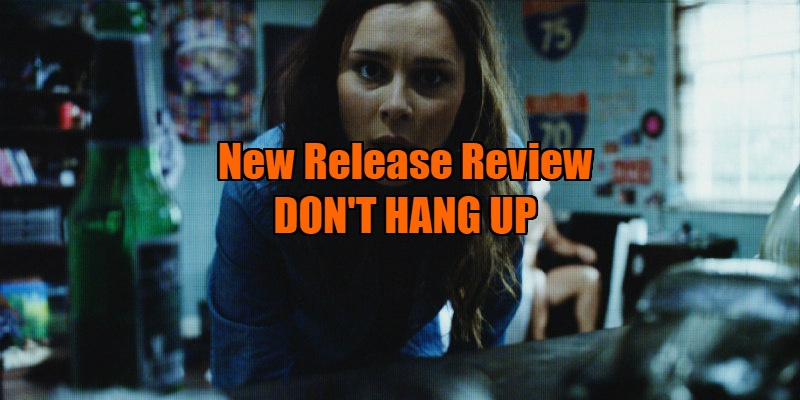 Don't Hang Up is on DVD June 12th and Digital June 26th.